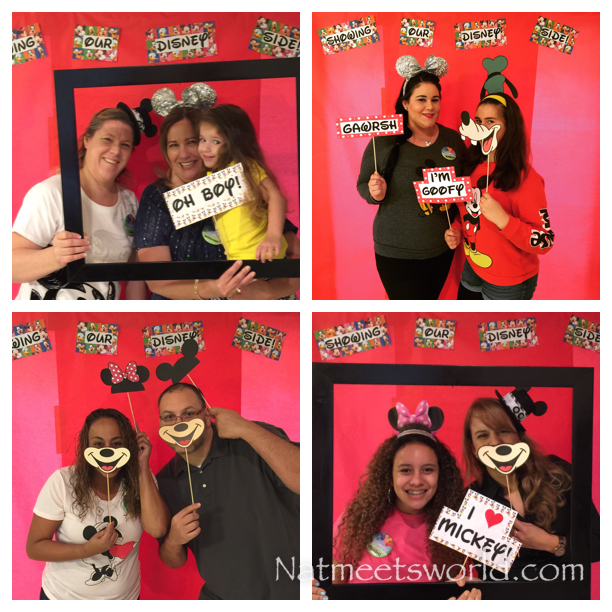 Showing our #DisneySide At A Mickey Mouse Through The Years Party! 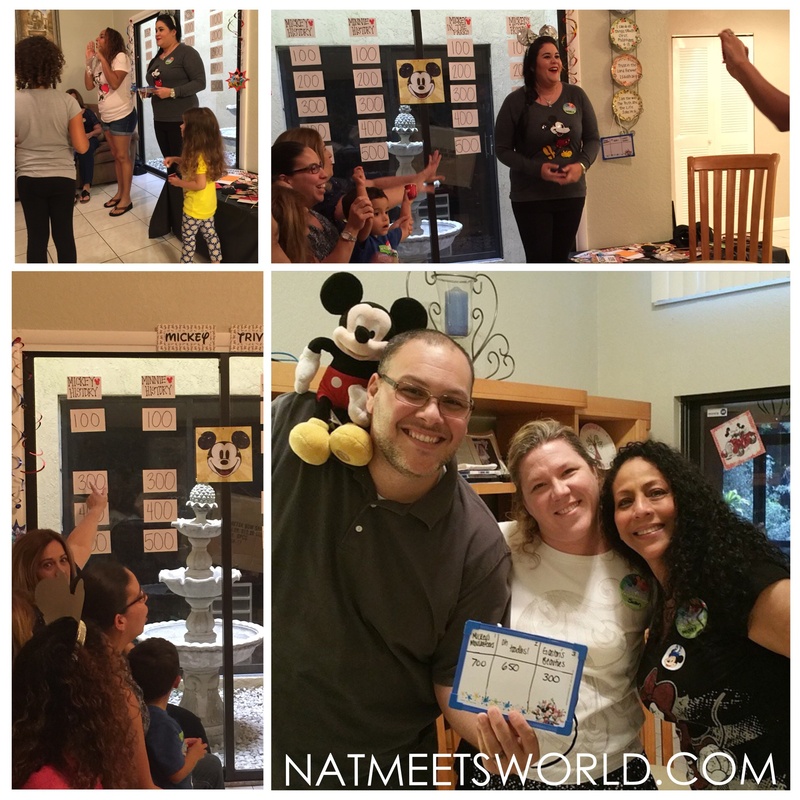 I was asked by one of my good friends Leanette, over at TeachMe2Save, to co-host a Disney Side party. I of course said yes without hesitation. We decided to make our theme ‘Mickey Through The Years’. Not only was this theme unique and fun, it allowed our guests of all ages to identify with the mouse himself. We used several items and pictures to represent Mickey from all eras, and the rest fell into place. 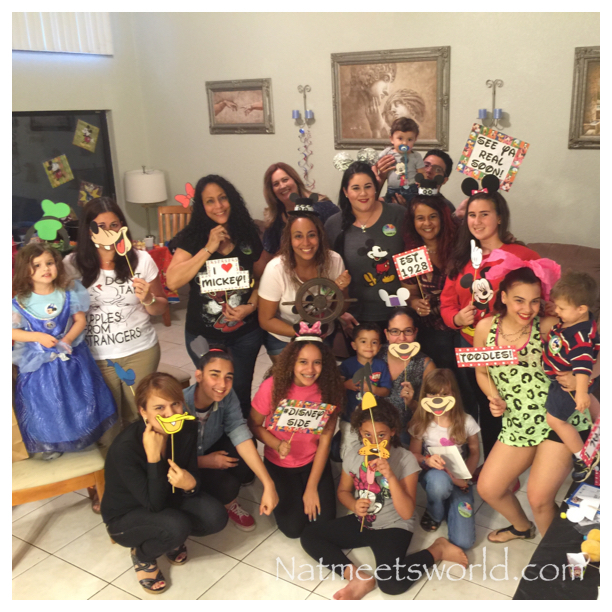 If you are thinking of throwing a multi-generational DisneySide party like we did, check out some of the great ideas we had! We used several pictures of Mickey from his older films and more current ones with calendar sheets (which were super inexpensive and a great alternative to spending money on expensive photos). 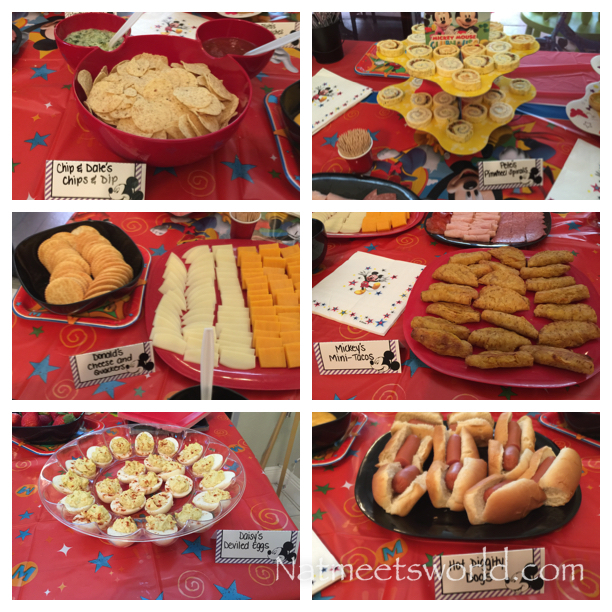 While we used his classic red, black, and yellow colors, we also used several Mickey Mouse Clubhouse themed items to represent the more current Mickey to give the theme of the party a good mix! Make sure you stop at the dollar store before heading over to any other location for decorations. They have a plethora of Mickey items that you can use! 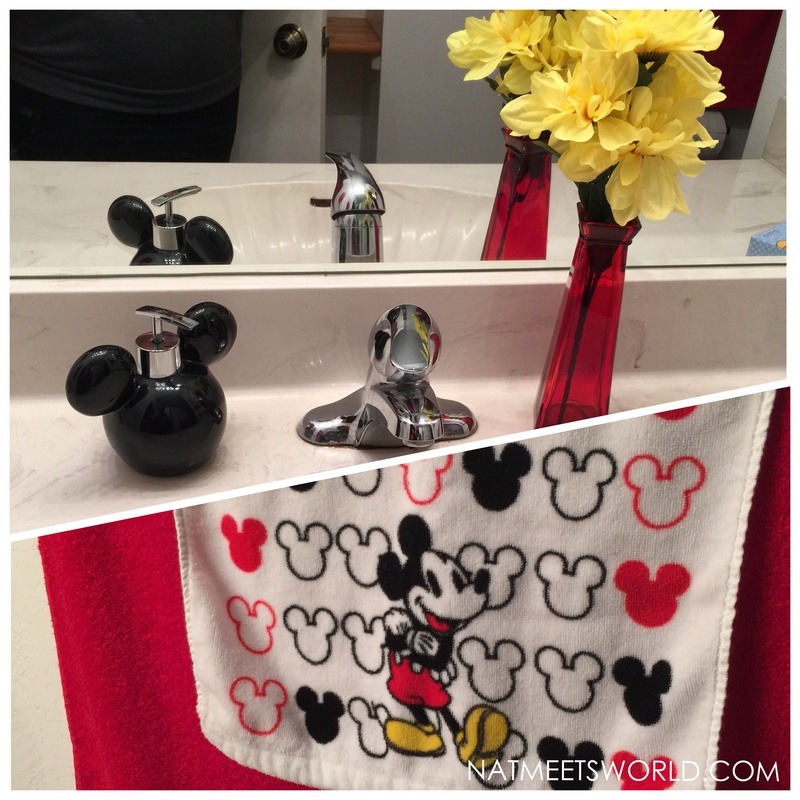 Check out our bathroom decor! 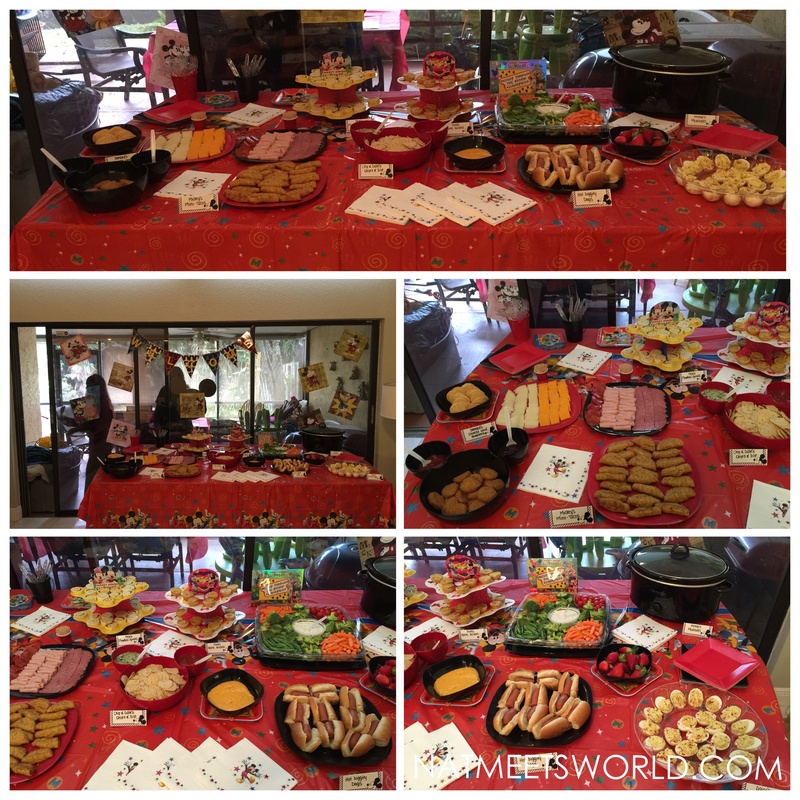 For our party, we served several finger foods and appetizers. Every dish had a ‘Mickey & Friends’ related name! We also had Mickey Mouse bowls (from Target) to add a little magic to the table! 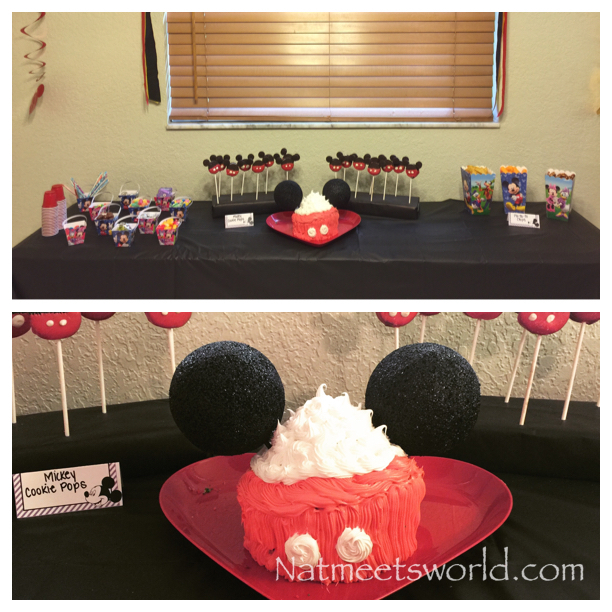 We also had a dessert table with Mickey Cookie Pops and a giant Mickey themed cake, which included his classic red shorts. We also had some snacks for the little love bugs to munch on while they played! 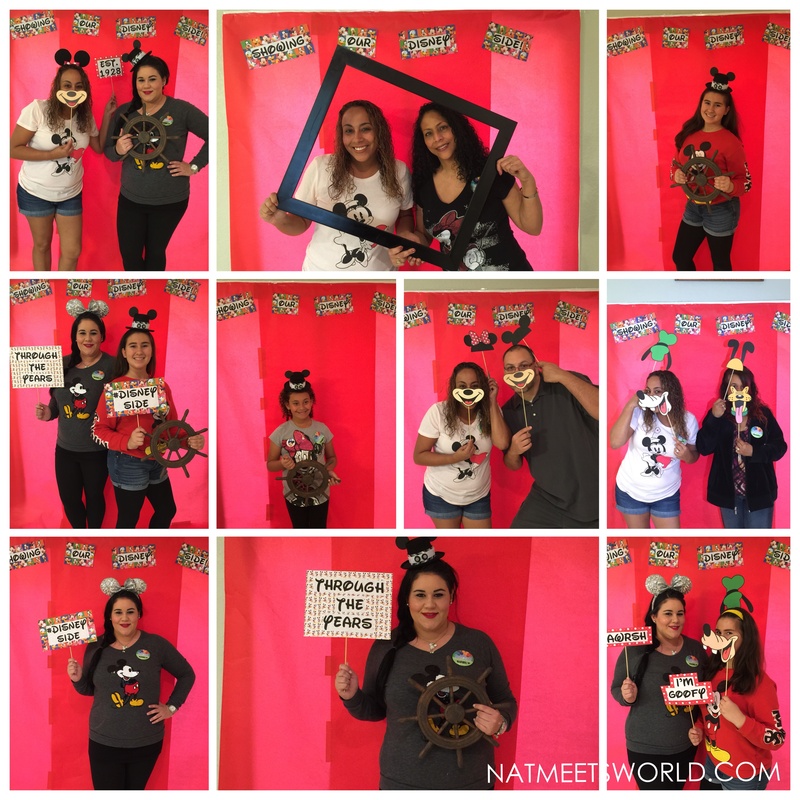 My favorite part of our party was our adorable photo booth! We used props to represent Mickey and his friends from their days on Steamboat Willie to more modern times. 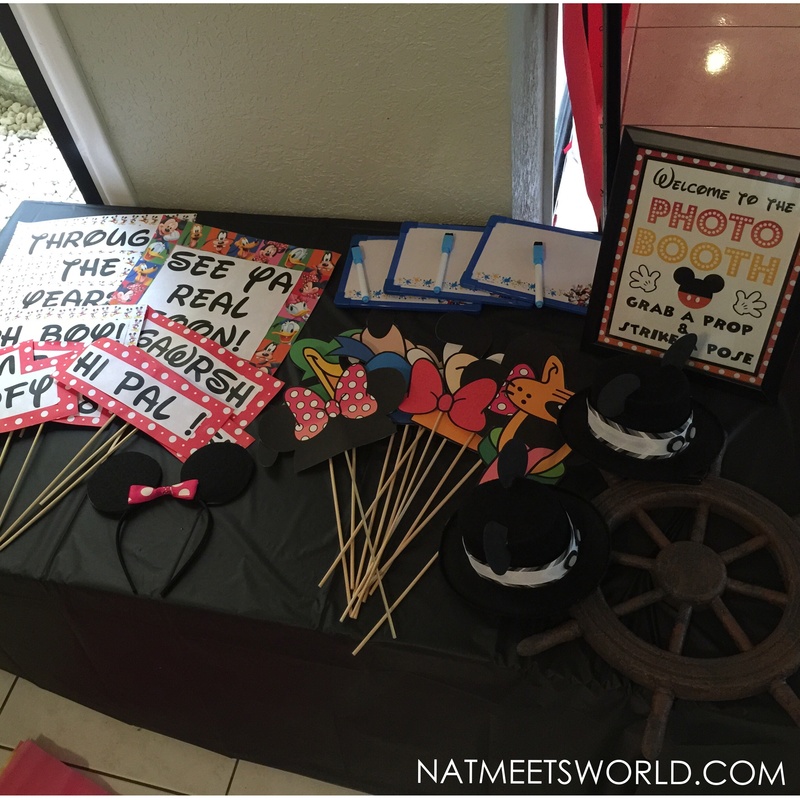 It was such a blast using these props to show our Disney Side! 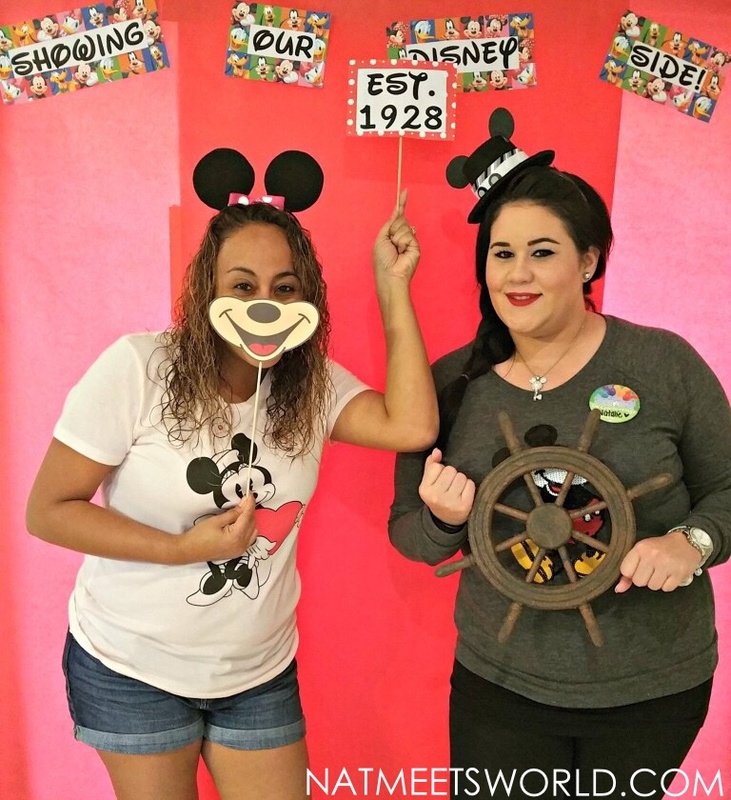 Our Mickey Mouse friends cut-outs are from Etsy and we also used a black frame and boat steering wheel from Hobby Lobby to complete the Steamboat Willie look. I also used a small top hat with some ribbon and foam to create some Steamboat Willie hats. We all had a blast using the props and I have to say, this was quite the hit! You can make some really cute props with inexpensive materials to create some unique memories! Anyone that knows me, knows I absolutely love playing games at parties. Who doesn’t love a little friendly competition? 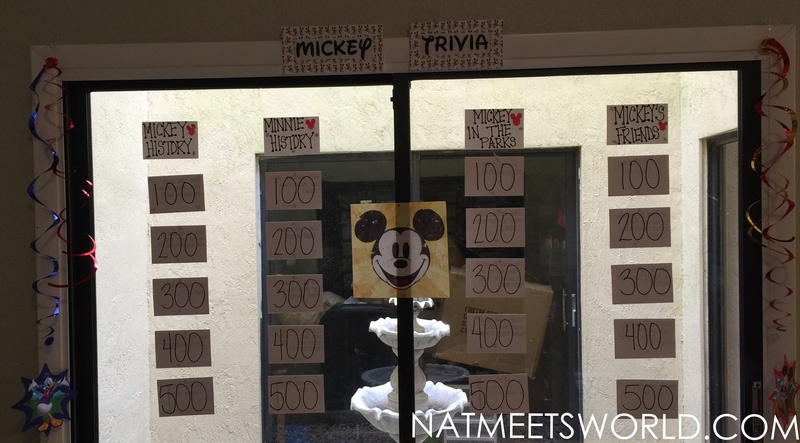 Our first game was a round of Mickey Trivia (which was played in a Jeopardy style). We had four categories and five questions in each category. The categories included: Mickey History, Minnie History, Mickey In The Parks, Mickey and Friends. We used index cards and scrap paper to create the game. We then divided the party into three teams. They chose their own group names (which I thought were very clever)! Team 1: Mickey’s Mouseketeers, Team 2: Oh Toodles!, Team 3: Gaston’s Beauties. All teams are in the picture below, along with their beautiful trivia host, me! We had a Mickey plush in the center of the room. After I read the trivia question, each member’s designated ‘grabber’ would try to grab the Mickey plush first before any other team to answer. Lets just say, Leanette and I were not expecting such a competitive group (which made it that much more fun)! Thanks to Leanette video taping the madness, you can see the competition here for yourself! 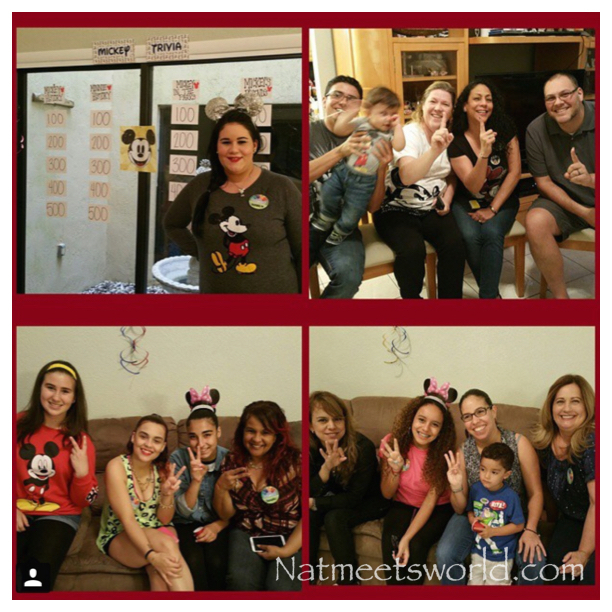 In the end, Mickey’s Mouseketeers took home the trophy with the win! Another fun game was ‘Create a Character’. Here, teams were given a bag with random items (i.e.- toilet paper, construction paper, ribbon, pom-poms, pipe cleaners, etc.) and were told to create a character using only the items they had in their bags to represent it. I have to say, if these people were chosen to design outfits for Project Runway, they would probably make jaws drop. I was really in awe of how creative every team was with the limited resources that they had! I honestly thought we made it difficult for them to achieve their characters, but they blew me away! 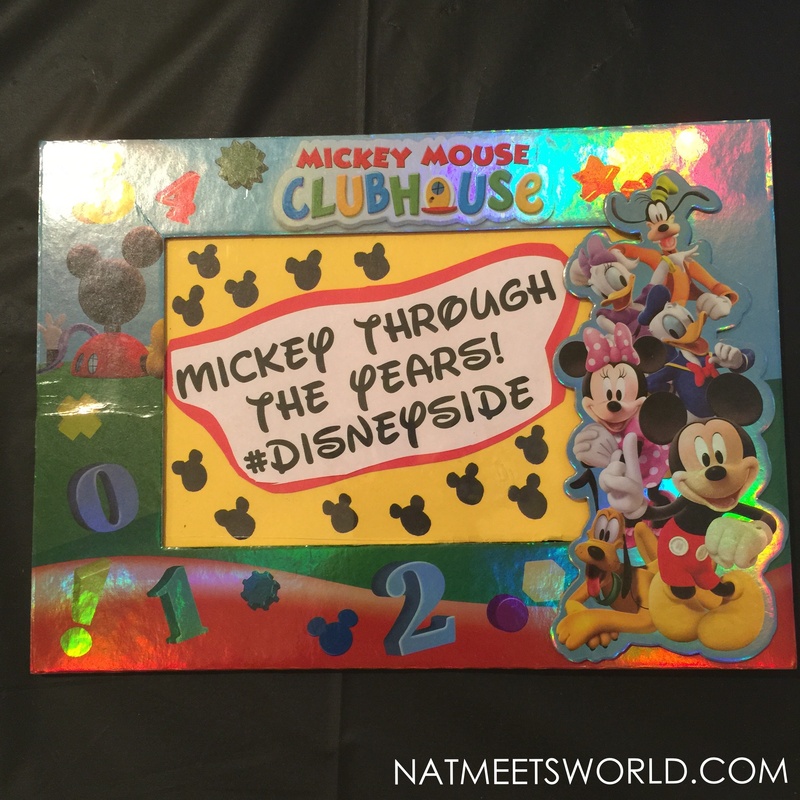 If you visit the Disney parks and mention that you are throwing a Disney Side party, they will be more than happy to provide you with stickers and buttons! I was able to snag these for our guests on my most recent trip! Leanette also headed to Target’s dollar section and sent her guests home with some adorable Mickey Mouse planners and other little treats. My co-host, Leanette and I! We had such a fun time showing our Disney Side! Comment below if you have any questions! 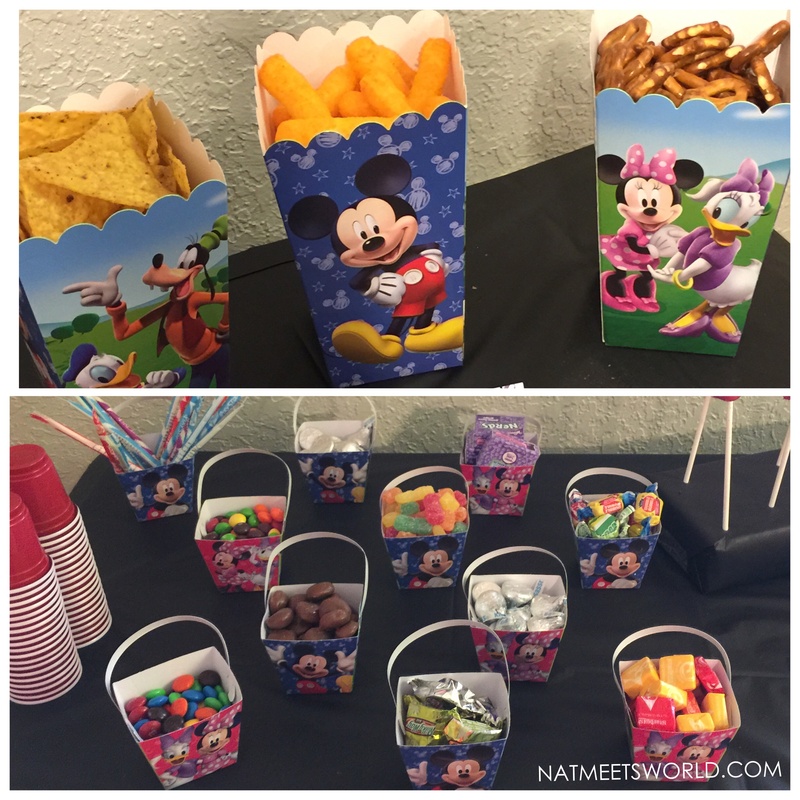 I would love to hear your Disney Side party ideas too! Thank you so much for your kind words! 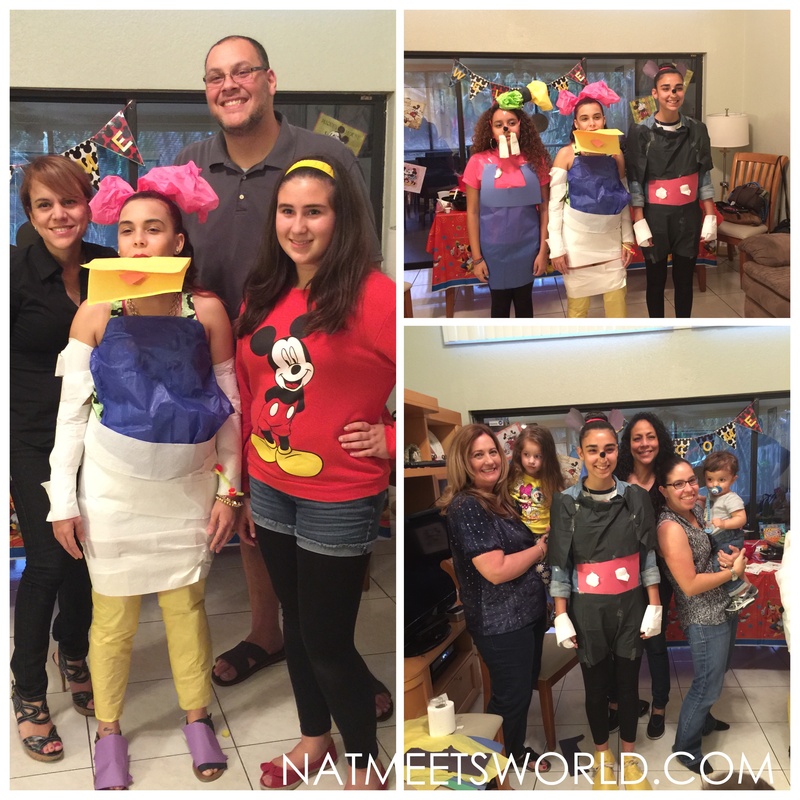 When you are ready to throw a Disney Side party, don’t hesitate to ask for some ideas if you need some!